Tangled and True: paper table. I'm so excited about this company. 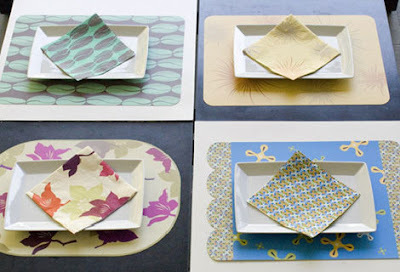 Paper Table = perfect for Summer dinners! The concept? Paper tableware that can mix and match while being "sophisticated, afordable and kind to the environment." Paper Table products include table mats, luncheon and cocktail napkins as well as coasters. All available in 7 different themes. All mats are made of synthetic paper that is waterproof, tear proof and completely reusable. "We love the smooth matte finish of the mats, but we especially appreciate that they are 100% recyclable and tree free. (And really easy to clean, a theme we embrace.)" "Our napkins and coasters are disposable paper, printed with water-based inks, no chlorine, and are completely biodegradable." the placemats are washable and reusable! maybe that will help your paper products dilemma.